The brainstem is composed of the multi-colored structures above, which include the midbrain, pons, and medulla. The spinal cord enters the skull through an opening known as the foramen magnum. 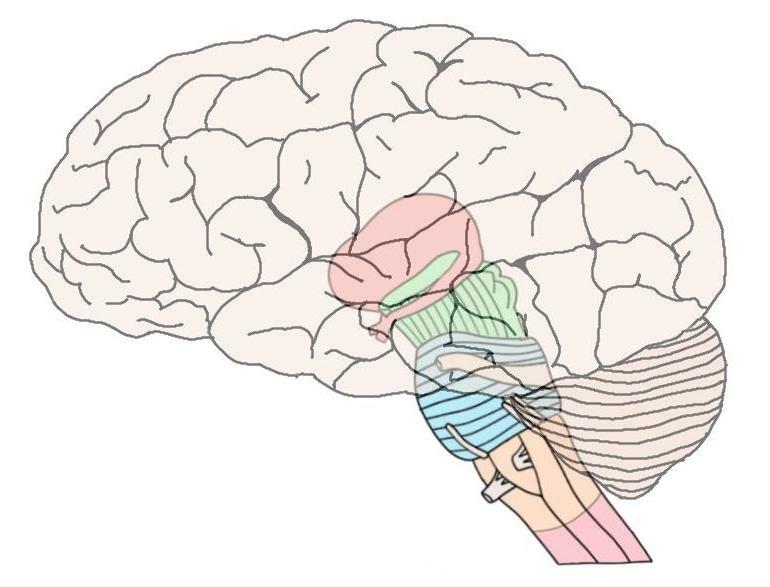 At about this point, the cord merges with the medulla oblongata, which is the lowest part of the brainstem. The brainstem is thus the stalk that extends from the brain to meet the spinal cord, and is clearly visible when looking at the brain from any perspective that allows the base of the brain to be seen. The brainstem is made up of 3 major structures: the medulla oblongata (usually just called the medulla), the pons, and the midbrain. What is the brainstem and what does it do? In addition to connecting the brain to the rest of the nervous system, the brainstem has a number of essential functions. To simplify things, I'll discuss some of the functions associated with each of the three major regions of the brainstem. It should be noted, however, that the organization of the brainstem is very complex and this is just an overview. In addition to being the point where the brainstem connects to the spinal cord, the medulla contains a nucleus called the nucleus of the solitary tract that is crucial for our survival. The nucleus of the solitary tract receives information about blood flow, along with information about levels of oxygen and carbon dioxide in the blood, from the heart and major blood vessels. When this information suggests a discordance with bodily needs (e.g. blood pressure is too low), there are reflexive actions initiated in the nucleus of the solitary tract to bring things back to within the desired range. Thus, the medulla is essential to our survival because it ensures vital systems like the cardiovascular and respiratory systems are working properly. Additionally, the medulla is responsible for a number of reflexive actions, including vomiting, swallowing, coughing, and sneezing. Several cranial nerves also exit the brainstem at the level of the medulla. The next structure on our way up the brainstem is the pons. The pons is hard to miss; it is a large, rounded, and bulging structure just above the medulla. The word "pons" means bridge in Latin, and it resembles a rounded bridge that connects the medulla and the midbrain. The pons is an important pathway for tracts that run from the cerebrum down to the medulla and spinal cord, as well as for tracts that travel up into the brain. It also forms important connections with the cerebellum via fiber bundles known as the cerebellar peduncles. The pons is home to a number of nuclei for cranial nerves. Nerves that carry information about sensations of touch, pain, and temperature from the face and head synapse in a nucleus in the pons. Motor commands dealing with eye movement, chewing, and facial expressions also originate in the pons. Additionally, cranial nerve nuclei in the pons are involved in a number of other functions, including swallowing, tear production, hearing, and maintaining balance/equilibrium. The final branch of the brainstem as we move toward the cerebrum is called the midbrain. The midbrain contains a number of important tracts running to and from the cerebrum and cerebellum, as well as some key nuclei. The upper posterior (i.e. rear) portion of the midbrain is called the tectum, which means "roof." The surface of the tectum is covered with four bumps representing two paired structures: the superior and inferior colliculi. The superior colliculi are involved in eye movements and visual processing, while the inferior colliculi are involved in auditory processing. At about the level of the superior colliculi, but located more anteriorly (i.e. toward the front) is another important nucleus called the substantia nigra. The substantia nigra, which literally means "black substance," was so named because it appears very dark in an unstained piece of tissue. The substantia nigra is rich in dopamine neurons and is considered part of the basal ganglia, which is a collection of nuclei that are crucial to normal motor movement. In patients who are suffering from Parkinson's disease, neurodegeneration occurs in the substantia nigra, and this neurodegeneration is associated with the hallmark movement dysfunction we see in Parkinson's. Although it is the most evolutionarily ancient part of our brain, the brainstem is still very complex and has a long list of roles that haven't been included here. The brainstem may not provide us with the higher intelligence we normally associate with being human, but it does carry all of the information to and from those areas we do associate with higher intelligence. And, just as importantly (if not more so), it ensures the vital functions necessary to support those areas continue uninterrupted.